Mike proposed and then I finally told you guys the whole story. Then I gathered some of my initial thoughts on being a bride. I do have some updates for you guys!! 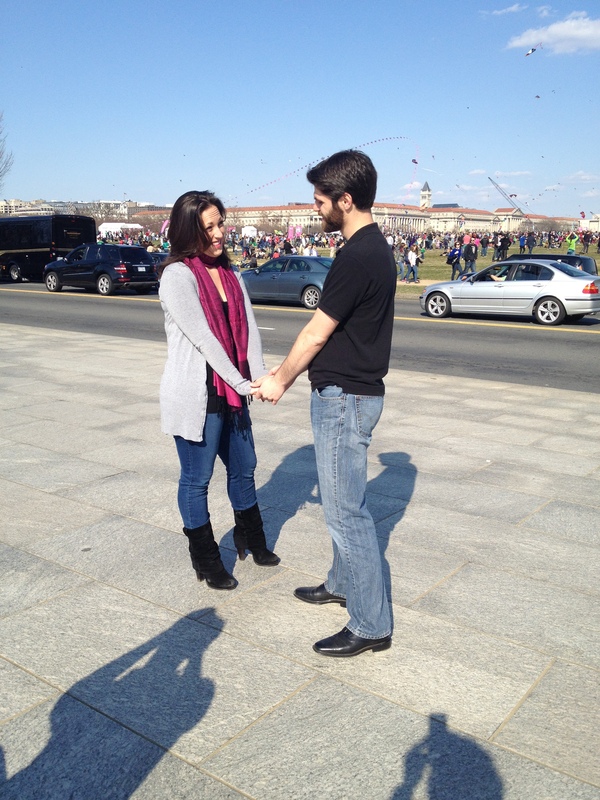 We will be hosting our wedding at the Key Bridge Marriott in Rosslyn, VA. I knew I wanted a hotel venue because it just seemed a LOT easier and a lot of stuff already comes with the package. Plus, since the majority of our guests will need to travel to the wedding, it is easier to have the reception at the same place where people are sleeping. The Zimmermans do not condone drinking and driving. But we strongly encourage you to drink! Initially, I really wanted to have the wedding at a venue in DC but we couldn’t find many options (that were in our price range) that could accommodate our numbers. While Mike and I are very committed to not having a crazy over-the-top wedding, we cannot commit to having a small wedding. We just have large families and large extended networks of friends who we want to be included in our day. I am committed to keeping the final number under 200 but it’s creeping up. Arlington venues had bigger rooms but still offered proximity to DC. Even better, the Key Bridge Marriott’s ballroom is on the top floor with gorgeous views of the Potomac River, the Kennedy Center, and my alma matter, Georgetown. SCORE. 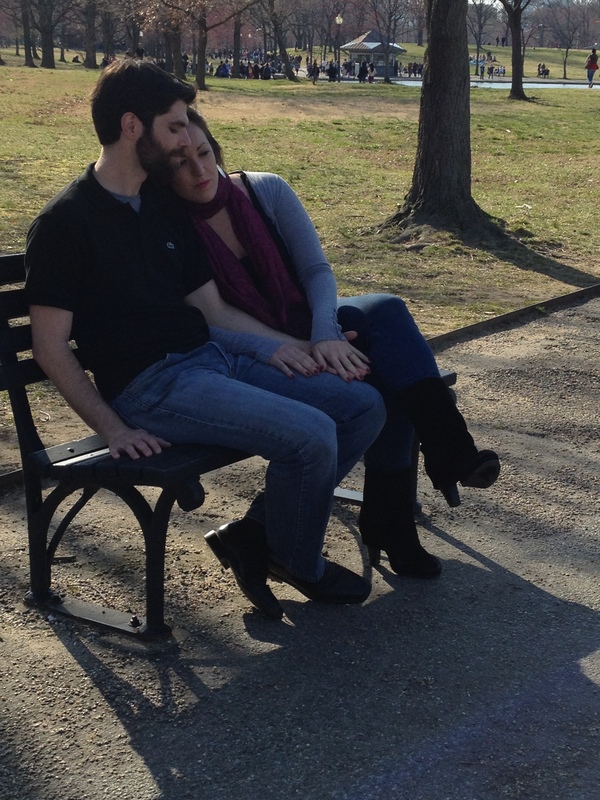 We took our engagement photos. A wonderful family friend is a very talented photographer and he came down to DC last Saturday to take our engagement photos. We were hoping for Cherry Blossoms but no cigar. However, we happened to pick the day of the Kite Festival which was actually really cute. Waiting for the pictures and I’m nervous / excited. I’m worried I made weird faces lol. We will likely use one of these photos for our save the date and the others on our wedding website (which is still VERY MUCH under construction). Here’s a couple that my mom snapped on her phone during the shoot. Can’t wait for the real images! We have confirmed our wedding party. We are having a small wedding party, which I think is the ideal match for our personalities. I will be having my best friend as my maid of honor and two bridesmaids (one friend and one cousin). Mike will be having his brother as his best man and two groomsmen (my brother and his friend). We are currently working out how we want to include other special people in the day including readings, ushers, musical performances, etc. A church for the ceremony – it was important to us to find a ceremony location where we felt comfortable. I would like a family friend (who is a minister) to perform the ceremony and want a church that looks beautiful but also aligns on some of my social values. A photographer – I am in talks with someone who I know / have seen her work etc. A DJ – I am in talks with someone recommended by one of my bridesmaids. I know him / have seen him work as well. The dress – We are VERY close to the final one. I went shopping again with my mom this past weekend and I think we might have found the one. No details though … have to leave some things until the big day! Confirm all of the above. Most importantly the church. I’m engaged as well! Though our wedding will be in Nashville, not DC. I have been to that Marriott — it’s beautiful! My biggest wedding planning victory thus far has been using paperlesspost.com instead of traditional paper stationary. What a money saver! That’s such a good idea! A coworker told me about something similar for electronic save the dates / invites. I don’t know that my mom is 100% on board with that yet though. I’m working on her 😉 When are you guys getting married?? I feel your pain on wearing the ring to the gym. I always make sure I leave my wedding rings at home when I exercise. My hands swell when I run and it digs in when I lift weights. Thank you!! That’s definitely our primary focus 🙂 So far we’ve had totally minimal stress and drama, which we definitely like!! Nice progress on the wedding front! Good call on pushing the date to the 22nd. That storm would have made me nervous, too! And I think it’s great that you are trying to make things easy for your out of town guests. I hope you post the final engagement shots! Thank you!! I’m definitely of the mind set that while it’s “our wedding”, a HUGE part of the actual event is all the people who love us enough to be there to celebrate so I want it to be a great experience for them! I am so excited to get the final pictures from our photographer, I will definitely post the shots! !